Phoebe Dierdorff and Luke Long (above) as "Zip" and "Zero" or, possibly, the other way around. 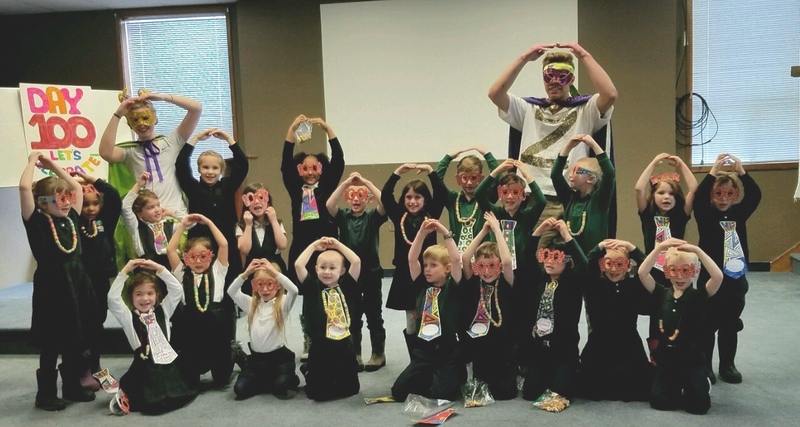 On the one hundredth day of school, regular as clockwork, large numbers, and the school calendar, Zero and Zip appeared from nowhere - well, okay, from the senior class - to lead kindergarteners in a whirl of activities to celebrate and teach about the number 100. The students had already prepared for this visitation. They had made 100 snacks from 10 different ingredients. They had stacked 100 cups. They had made colored ties to wear and fashioned mathematically precise necklaces from 100 Fruit Loops. Best of all, with Zero and Zip, they threw bean bags 100 times into a special bean bag thingy (editor's note: 'thingy was Mrs. Kind's term, which seems spot-on to us). It might not seem as though Zero and Zip had much to do besides eat, throw bean bags into a thingy and wear necklaces, but do not fear. They talked happily about the Zebras and Ziraffes on their planet (supplemental editor's note: we do not remember Ziraffes from our kindergarten class). Zero and Zip led the children to perform 100 different exercises. They even encouraged everyone to think of things they would be happy to have zero (0) ... of. Almost before the class could thank them suitably - 100 times, we trust - Zero and Zip had returned to their far-away planet. Rumors are rife in grammar school that the pair (2) are already helping their successors plan for next year's One Hundred Day Spectacular.